Companies and organizations who partner with CBCF join a distinguished group of supporters who have created an immeasurable impact in the lives of those we serve. We are committed to developing strategic partnerships with companies who share our mission of eliminating disparities within the black community. We are an established public policy organization with proven results. CBCF offers companies several options to develop a unique partnership with an organization that is nationally recognized for its programs and events. CBCF has a myriad of programs that give our partners that opportunity to demonstrate their commitment to issues directly affecting the black community. The range of opportunities offered guarantees unique and multiple platforms for a company or organization to gain valuable exposure to our diverse and engaged audiences while supporting the numerous research, education and scholarship programs provided by the Foundation. There are a variety of ways your company or organization can support CBCF. Please see our sponsorship guide. Each sponsorship opportunity comes with its own unique benefits. You are encouraged to consider all of the opportunities and determine what best meets your company’s goals. 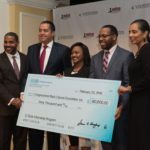 For more information on becoming a Corporate Partner, please contact RD@cbcfinc.org and a member of the Resource Development team will be in touch with you in two to three business days.